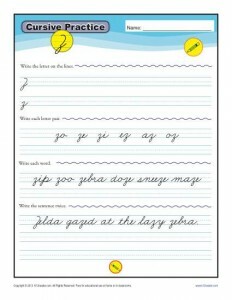 Use the printable cursive letters worksheets below to practice learning cursive letters from A to Z! Each of the printable alphabet sheets are free home or school use. Just click on the letters below to print a worksheet. Students will practice writing each letter of the alphabet on one line, and then practice writing words using each letter. There are 26 worksheet activities. Here’s some awesome cursive practice for the letter A! Big bad B is the focus of this cursive writing worksheet. Calling all Cs for this cursive worksheet! This darling D cursive worksheet wouldn’t dare to disappoint! Every E is excellent after some cursive practice! You’ll find a fine worksheet on the letter F here. Glorious G is glad to grace this page! H is happy to help your student learn cursive! It’s all about important I in this worksheet! J is just jolly in this cursive practice. Kindly K can keep your student practicing in this worksheet. The letter L is lovely to learn in this cursive handwriting page. This handriting worksheet includes 26 pages, with all letters of the alphabet. Your student will make many Ms in this cursive worksheet. Never neglect the letter N! Onwards to the oval O! The pleasure is ours in this popular P practice page! Q is quite a quirky letter, but it still needs to be practiced! You’ll be rocking with this “rad” letter R worksheet! Serious students say S is superior!